The DotCode barcode symbol type is a public domain optical data carrier designed to be reliably readable when printed by high-speed inkjet or laser dot technologies using codes with dots. Thus real time data like expiration date, lot number or serial number could be applied to products in a machine-readable form at production line speeds. Major CPGs recognize it's ability to support anti-theft and counterfeiting initiatives because it is difficult to duplicate. Unlike other dot codes, and all other matrix symbologies, this results in dots which are aligned on a grid diagonal to the edges of the rectangular outline of the symbol. The sum of H and W must be odd; in other words either H or W must be an odd value and the other even. In some applications, the height H will be fixed and the width W will vary with data content, or vice versa, creating ribbon-like symbols appropriate to many high-speed dot printing methods. In other applications the aspect ratio of H and W can remain roughly fixed, both dimensions varying with data content in a continuum of symbol sizes. 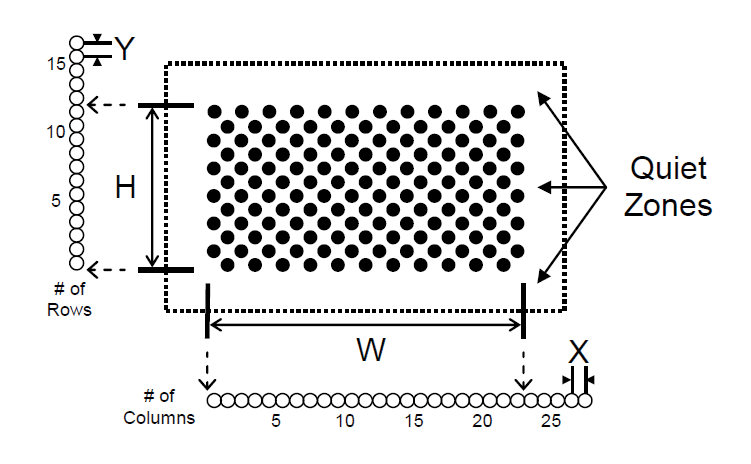 Two dimensional image readers can autodiscriminate all such symbols. Logically, DotCode employs message encoding originally inspired by Code 128 and strengthened by Reed-Solomon error correction. Like Code 128, a proper subset of symbols is set aside for GS1-formatted data messages. It is designed, both graphically and logically, to tolerate missing, extra or poorly-placed dots without sacrificing reading integrity. Manufacturers of barcode equipment and users of the technology require publicly available standard symbology specifications to which they can refer when developing equipment and application standards. The publication of standardized symbology specifications is designed to achieve this. How do we help developers using DotCode? The Cognex Mobile Barcode Scanner SDK supports DotCode detection, enabling developers to gather relevant workflow and application data. You can download the SDK for free by registering on the Cognex Mobile Barcode Developer Network. In addition, the Barcode Scanner SDK supports a broad range of symbologies to meet your growing development needs.